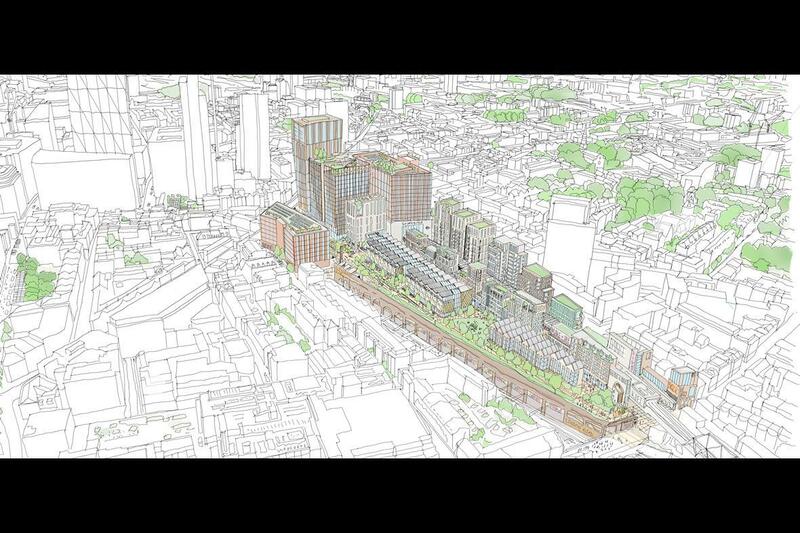 Revised plans have been put to the Mayor of London for Bishopsgate Goods Yard, replacing around 1,300 units in a 46 storey tower in the previous PLP scheme to just 250 in the revised scheme by FaulknerBrowns, Buckley Gray Yeoman, Chris Dyson and Spacehub. The site is an incredibly complex one with multiple levels, rail tunnels underneath and the new East London Line (now overground) Connection running through it in a concrete box which is designed to be built around and over. There is also the Grade II listed Braithwaite viaduct which can only take so much weight on top. The scheme has been revised down to almost nothing in housing terms to meet conservation and overshadowing concerns. Only parts of the site can take deep foundations. These parts are office and culture led. The concern of the site brief was to create something like London’s Highline on top of the listed Braithwaite viaduct. This was misconceived as unlike the highline it would go nowhere. The railway viaduct is much better put back into its original use, as a terminus station, London’s first since Marylebone. Look here at Table 5.7, on page 80 of the Anglia Route Study. Creation of an additional terminus station to the north of London Liverpool Street within the area of Network Rail owned land adjacent to Shoreditch High Street station on the East London Line. This would potentially be utilised by services from the West Anglia route. Where the rail line bridged over the Liverpool street entrance from the south of the existing line is still undeveloped. 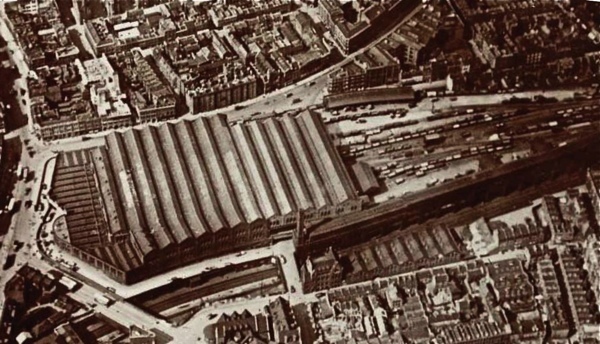 It is possible to create a new terminus here, just like the original terminus of the Great Eastern Railway which became Bishopsgate Goods Yard after Liverpool Street Opened. 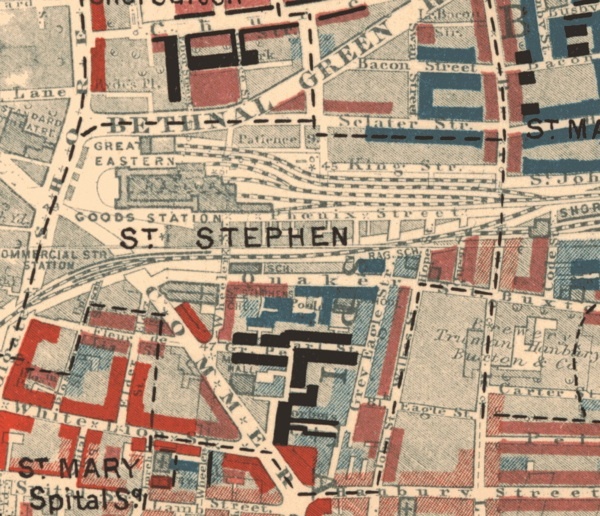 Only now not just a terminus as the East london Line (now the Overground) links through, with the on site new Shoreditch High Street Station, with its extension to Highbury and Islington . This could make a new terminus and interchange important in terms of linking through between North est London and the East of England and reliving overcrowding at Liverpool Street rail and underground stations. A less than 300m underground travelator could link through to Liverpool Street Station and suburban London Overground trains could have dedicated platforms at Bishopsgate itself. Why is this important? The lines into London from the East of England go into Fenchurch street (the Southern Branch of the London Tilbury and Southend (C2C) line) and Liverpool Street (the West Anglia Line to Chelmsford, Colchester, Ipswich and Norwich and the branch to Southend Victoria). Both lines are full with the greatest throat constraints of any London termini and Fenchurch Street the smallest number of platforms (and no tube connection). There are things that can be done to increase capacity at both such as increasing trains to 12 carriages where possible and in the medium term digital railway (Japanese style signalling), but these wont increase capacity by more than 15% or so. This leaves very little headway for ‘Transit Orientated Development’ around exiting or new Stations in South of North Essex. Essex is a big county with huge housing requirements under the standard method till 2050. Its roads cant cope with congestion on the A13 and A127 already the busiest A roads in the South of England taking motorway levels of traffic, which will only get worse with the Lower Thames Crossing. The natural inclination is to place development at railway nodes like Marks Tey, West Tey being one of the North Essex Garden Communities, between 20-30 thousand dwellings, potentially twice as large as Ebbsfleet. But the West Anglia Route is at capacity here. South Essex has equally stark choices. Even after accounting for brownfield sites and outstanding permission and sites in emerging local plans it has a shortfall of roughly 50,000 dwellings to 2037, to which you can add 60,000 more required by the standard method to 2050. These will inevitably be primarily on the Green Belt, and it is likely sites at or close to existing and new stations will be favoured including the previously promoted Tillingham Hall site south of West Horden. 110,000 dwellings. 10 Secondary School sized Garden Communities. Most of these, unless you add options for commuting by building a Kent Essex Rail Connection by adding an additional rail tunnels to the East London River Crossing (as the Thames Estuary 2050 Armitt Rport suggested, and which the government still hasn’t responded to in full). will rely on extra capacity being found to Fenchurch Street and Liverpool Street. At Fenchurch street there is a plan having been on the drawing board for years, redevelop Tower Gateway as a new terminus taking the DLR to bank into tunnel earlier, and the new tunnel providing an underground link to Fenchurch street. This will be expensive but would dramatically improve Capacity and interchange at Fenchurch street and transform the accessibility of South Essex. In terms of the Greater Anglia Line the Anglia Route study sets out the only realistic option for major capacity increase. The cover for a new interchange could be lightweight and suspended, like the Fosters Design for Dresden Station, meaning it could be built over but not on top of the viaducts. Together they could unlock the potential for up to 140,000 homes, and potentially 200,000 if the potential for a new City South of Norwich roughly in the Diss Area is considered and further expansion of Ipswich. In the run of things loss of the max four-six storey buildings on top of Braithwaite viaduct is small beer. How much precisely could this potential be blocked. We don’t know because a Eastern Rail Study covering Essex and the Anglia Line has not been commissioned, nor has a study into the potential for a Kent-Essex Rail link linking the North and South of Thames Arms of Crossrail. No-one is willing to take ownership and responsibility for this in our less than integrated system of land use and transport planning in England where the strategic plan for London takes little notice of that for South Essex and North Essex and vice versa and given the lack of staff and funding (Transport for East is one guy – the same overworked guy as for Essex, compared to TfL?). In the lack of coordination the SoS for Communities and Transport need to issue a holding direction to ensure this potential is not blighted before it is studied and the EUV of the land is not raised to make the scheme impractical. Network Rail have a clear conflict of interest here, they own the land. If Essex and Homes England want a large long-term pipeline they need to get involved behind the scenes. The Mayor of London also needs to take a long-term view, he has enormous leverage here with the East of England authorities and should leverage it so some of the additional housing serves London overspill needs and some of the land value capture goes towards the new termini. TfL has today published research that shows improvements to make it easier and safer to walk and cycle in London’s town centres and high streets lead to an increase in retail rental values, more retail space being filled and a 93% increase in people walking in the streets. The research has also found that people walking, cycling and using public transport spend the most in their local shops, spending 40% more each month than car drivers. In one major study published today, locations including Bromley North Village, Hornchurch Town Centre, Clapham, Woolwich Town Centre and Walworth Road were studied to assess the impact of improvements, such as widened footpaths, increased space for outdoor seating, new public squares and pedestrian crossings. The research has been published as part of a new online hub demonstrating the economic benefits of TfL’s Healthy Streets Approach, which aims to create high streets that are designed for people, inclusive and easy to access by foot or bike. Will Norman, London’s Walking and Cycling Commissioner, said: ‘With businesses across London really struggling to survive, we have to do everything we can to support them. ‘The evidence is clear – adapting our streets to enable more people to walk and cycle makes them cleaner, healthier and more welcoming, which encourages more people to shop locally. Launched today, new online hub, The Economic Benefits of Walking and Cycling, will be kept up to date with research and statistics from TfL and others. Current material on the hub includes a report setting out the economic benefits of planning cycling and walking improvements alongside housing growth, a survey of Business Improvement Districts (BIDs) demonstrating the economic importance of walking and cycling to businesses across London, and research suggesting segregated cycle routes in London make our streets more efficient. The Mayor’s Transport Strategy aims to reduce reliance on car use and grow sustainable travel to improve quality of life, aiming for 80% of journeys to be made by walking, cycling or public transport. TfL’s investment in delivering Healthy Streets contributes to this by creating streets where people choose to travel actively, connecting communities, improving air quality and reducing road danger and noise. Lilli Matson, Director of Transport Strategy at TfL, said: ‘This research from our new online hub shows the link between creating enjoyable spaces, where people want to spend time, and the results for better business. Kay Buxton, Chief Executive of Marble Arch London BID, said: ‘We welcome the Economic Benefits of Walking and Cycling hub, and the wealth of information supporting the case for walking, cycling and using public transport. ‘As a BID we are committed to bringing forward schemes with TfL across the entire Marble Arch and Edgware Road area, from improving junctions and crossings through to creating safer routes to schools, businesses and leisure amenities. ‘Our members tell us that their staff, customers, guests, students and pupils need safer spaces in which to operate. Ruth Duston OBE, OC, CEO of Victoria and Northbank BIDs, said: ‘We recognise that enhancing the quality of the local environment in our areas is not just about creating token green spaces. Far from it, well designed and located ‘green’ interventions make good business sense too. ‘From our Business Low Emission Neighbourhood in the Northbank with healthier walking routes and the Love Your Side Streets programme in Victoria, to creating more attractive areas for people to dwell, such as Victoria’s Chelsea Flower Show Parklets, everyone benefits. Projects such as the Mini Holland scheme in Waltham Forest and the A105 Green Lanes scheme, linking Enfield Town to Palmers Green, are working to make London a greener, healthier and more attractive place to live, work, play and do business. The recent Active Lives Survey shows that Waltham Forest now has the highest percentage of adults walking at least five days per week of all the London boroughs, at 43%. This has increased by 5% since 2015/16. Residents in the areas transformed through the Mini Holland scheme are doing an extra 40 minutes’ walking and cycling each week, compared to before the area was transformed.